This image comes courtesy of the fun-loving Montgomery County, Maryland Police Department's unusually active Twitter account. 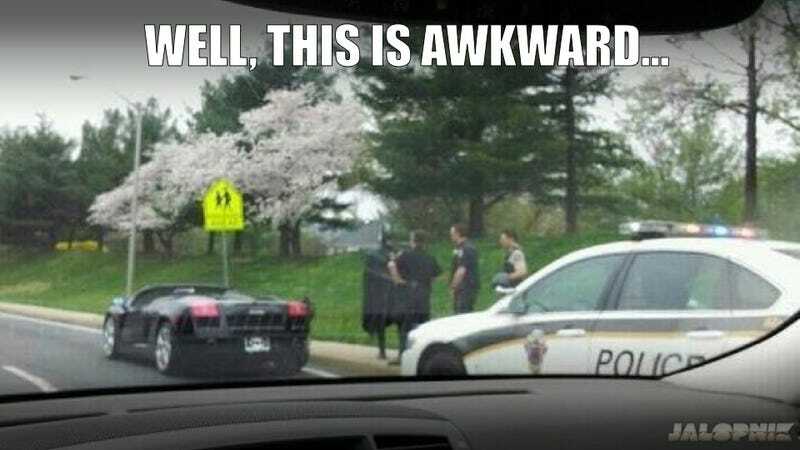 "Yes, Batman was stopped by MCPD on Wednesday,S/B Route 29 at Prelude Dr. for no tags on Batmobile"
His repeated attempts to use the Bat Signal as a form of ID also failed. UPDATE An anonymous tipster says he knows why this happened and the answer is extremely awesome. I've got a buddy in the MCPD and he told me this guy's story is actually pretty cool – he's crazy wealthy (off what I don't know), but he apparently goes to hospitals and meets up with sick kids as Batman to brighten their day. The tags were in his backseat because he couldn't get the poor people screws to work on his $800k car. As to why he was still in costume when he got pulled over, the latex suit is apparently not so easy to get in/out of, so he has to do it at home. Unfortunately he did not talk like Christian Bale or reference Commissioner Gordon and the bat signal at any time during the stop. Rich people have different screws? Also, $800K? Is this Eric Clapton's Lambo? UPDATE 2: So, the MoCo Police Department has a Facebook page and they've updated two more photos of this hilarious incident we've haphazardly tried to work into the post. Hat tip to Tom Scocca!